We continued on the descent of the gravel road to Waihola on the main road. As we neared the bottom the road finally turned back to smooth tarmac. A mile further on and we came to a section of newly re-laid sticky tarmac with loose stone on top not yet bedded down. As I cycled along everything suddenly seized up with a sickening crunch.It would appear that a stone sticky with tar had stuck to the chain as it went round and jammed in the gears and in the second before I stopped pedalling the force of the pedal revolution tore the gears off the gear hanger tearing out one of the jockey wheels. Close examination revealed that the really serious damage was to the gear hanger which is part of the frame. This was badly bent and the circle of the gear hanger torn apart leaving options of either welding repairs or a new frame. so far as bike repair facilities were concerned so clearly I had to return to Dunedin for repairs. We decided to split up. I passed the map and the paperwork for the accommodation to Martin. The plan was to meet up in a couple of days. 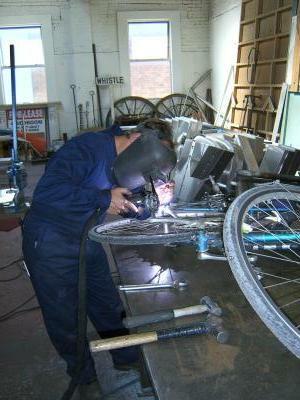 Back to Cycle Surgery and although full up with jobs they agreed to complete the repair for 4pm the next day. This will involve fitting a dropout support to replace the threads lost by the damage and the welding. They will also fit new gears by borrowing some from a bike as they do not hold the right type in stock. to meet up at Cromwell. 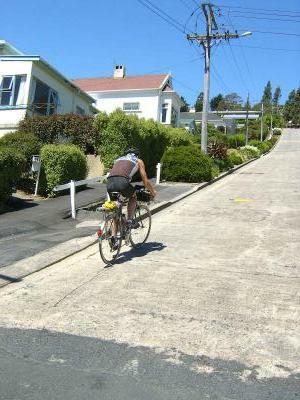 Following a route recommended by Pedallers Paradise we first rode along Stuart Street with a steep climb to 600 ft and then a long gentle descent down the Kaikorai Valley. 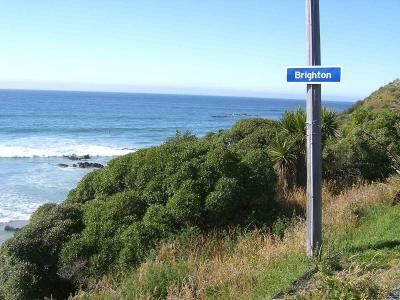 After cycling under the motorway we took quiet roads on the coast to the south of Dunedin to the small seaside town of Brighton complete with Downland landscape inland. The town centre for this Brighton consisted of one shop. We then continued on a beautiful coast road for another 10 miles with little traffic and mile after mile of empty white sand beaches pounded by the Pacific surf. We turned inland at Taieri Mouth and as the road climbed to a vertical 17% it also turned to gravel and climbed on and on to eventually reach 1100ft. Peter must have looked to have needed it because a local offered him a lift to the top. Peter had doubts about the wisdom of this when it turned out that the affable driver was totally drunk and Peter had to hold the wheel for part of the way up. From the top and on the descent there were great views of rolling downland which reminded Martin of Dorset. Further on the descent we met the local who gave Peter a lift. He was driving back clutching the bottle of whiskey he had purchased in town. He stopped to chat and advised that our destination for the day wasn't worth going to with a lot of Billy Connelly phraseology thrown in. See the next post for the rest of the day and some dramatic events. Vertical Climbs. Tuesday 1 February. Today was a rest day in Dunedin. In the morning we had some retail therapy including some more film and camera batteries and the obligatory browsing of the local bike shops. Elevenses was at the railway cafe and outside we spotted a signpost for various places in the world including Portsmouth 14,502 kilometres away. 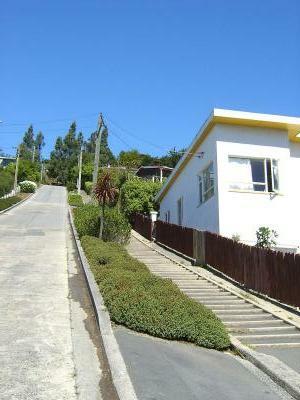 In the afternoon rode a short distance into the northern suburbs riding via the University and a walk in the Botanical Gardens to visit Baldwin Street the steepest street in the world. 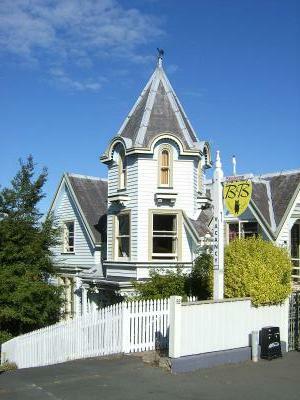 A rest day in Dunedin was planned in any event to allow for any problems with the bus transfer from Christchurch. 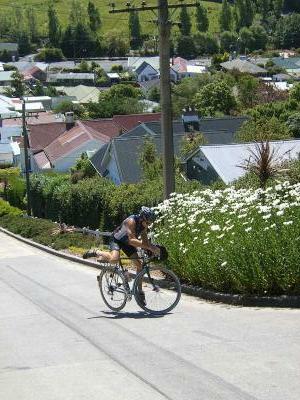 It was a bonus to be in Dunedin with bikes and time to spare and chance to visit a street with a gradient of 38%. I took pictures while riding for a short time and then got off and ran behind. Martin rode about 80% of the way up and over most of the steepest part before stopping. When he tried to start again he fell off being unable to get out of his cleats in time. We visited the tourist shop at the bottom and had a tea stop at the Botanical Gardens Tea Rooms. to Dunedin. 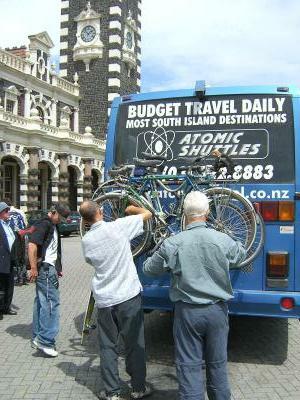 The bus firm, Atomic Shuttles took bikes on a rack on the back and were able to take 2 per bus. We had booked 2 of us on the 8.00 am bus and the third on the afternoon bus. When we all 3 arrived the bus driver agreed to fit all three with some handlebar turning. We got away at 8.30 with the help of a continental breakfast delivered to the room the previous evening. 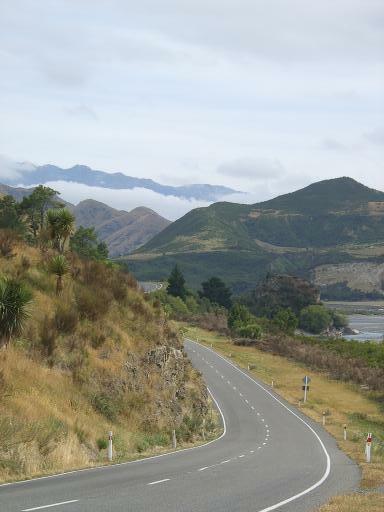 Hamner Springs is on a 10K deadend side turn from the main road so we headed down this road first. The main road had some ups and downs but more downs as we gradually descended from 1300ft to sea level. We stopped for tea at Amberley Tearooms passing up the chance to visit Amberley beach due to lack of time.We arrived at our B & B near Christchurch City Centre at about 6.00 pm. Distance for the day was 81.4 miles with 1049ft of climb 2106ft of descent. Our average speed was 11.2 mph and time riding was 7hrs 7mins. 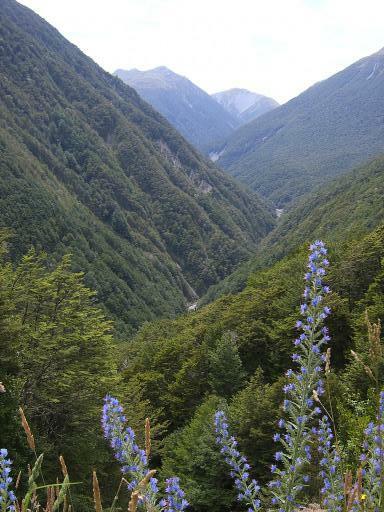 Maruia Springs to Hamner Springs, Saturday 29 January. 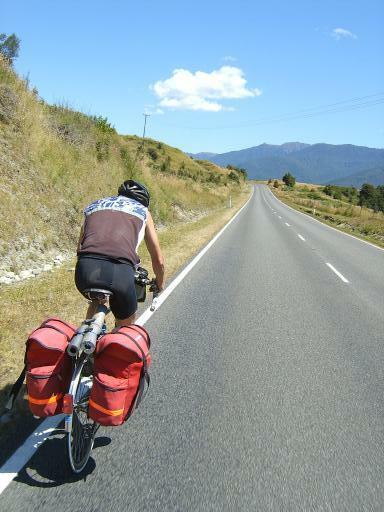 For today's ride Peter was worried about the heat and the 900 metres Lewis Pass so he arranged to get a bus. For Martin and I with a shorter than usual mileage we started the day with a soak in the hot pools and then elevenses at the hotel cafe. We bought supplies at the hotel as there was again nothing available on the route. The climb to Lewis Pass at 902 metres wasn't too bad as we were already at 600 meters for our overnight stay. The scene was of remote mountains and forests and light traffic even on a main road. The descent was one of the hardest I have experienced with a constant headwind and the road often climbed up and down the side of the valley.This was more than compensated for by the amazing scenery. See the pictures which are worth more than a thousand words. The days mileage was 47.9 with 2870ft of climb of which 1870ft was on the descent from the pass. Average speed was 9.9 with riding time of hrs 43mins. In the evening Martin and I tried a local remedy for our itches of a mixture of white vinegar and baby oil which had some limited effectiveness. 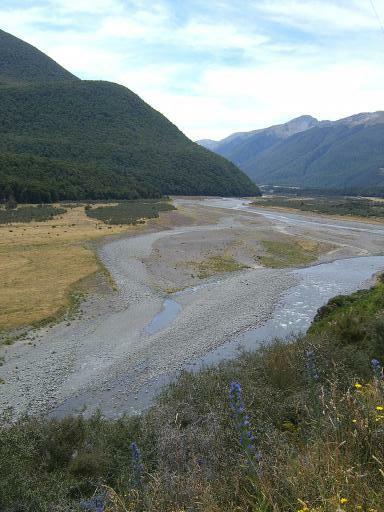 Murchison to Maruia Springs, Friday 28 January. We had a cooked breakfast delivered to our motel room at 7.30. Pedallers Paradise advised no facilities before our planned tea stop at Springs Juction so we stocked up at the Murchison Supermarket. We headed south on route SH65 and stopped for an elevenses break at a scenic bridge where a side road crossed over the river. 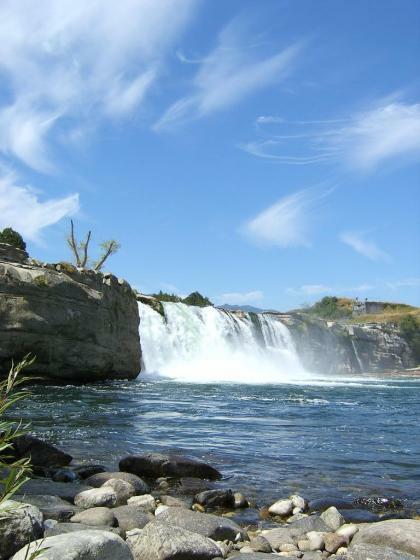 A few miles down the road we had another scenic stop at the Maruia Falls. This was formed only in 1929 when an earthquake diverted the river from its former course. There was then a long gradual climb to Shenandoah Saddle where we stopped for lunch and waited for Peter. 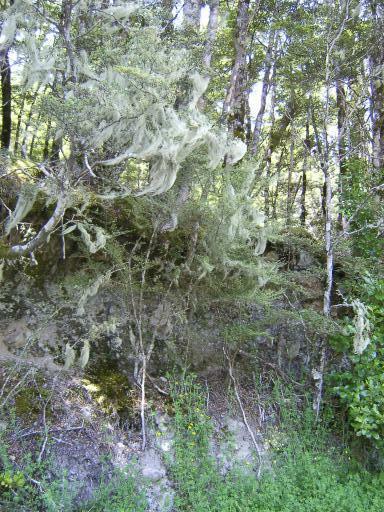 Unfortunately we had now reached the realm of the Sandfly the serpent of the eden of the West Coast of South Island. These are like mosquitoes with teeth twice the size. They come out any time of day and laugh off most types of insect repellant. Peter was feeling the heat which was again about 30C. By the time he arrived we were anxious to get away from the bites. Martin also needed to get to our nights accommodation early as he was meeting some friends who had moved to New Zealand. We agreed to meet up with Peter either at the Tea stop or at our destination. The ride down from the pass was hard with many ups and downs and with the effects of the heat multiple cool drinks were needed at the Springs Junction Cafe. With no sign of Peter we left a message with the cafe that we had gone on. Our destination was Maruia Springs Thermal Resort. 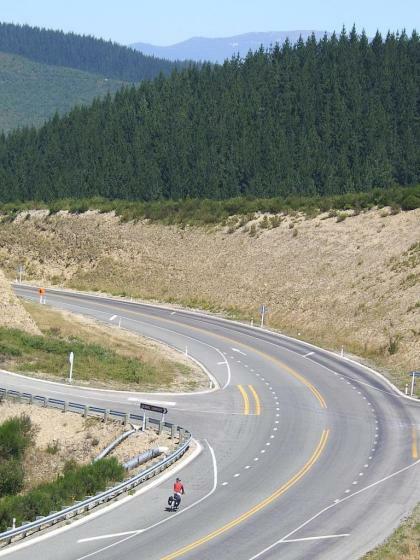 This is about 10k up Lewis Pass but before the serious climbing starts. Peter had an interesting story to tell when he arrived. On the ride from the pass to Springs Junction he found the heat was getting too much for him. He started talking to an elderly lady who was looking after some cows asking her if she knew of anybody who could give him a lift. She said she would do it herself except she couldn't be sure he was safe. Eventually she rang her daughter who told her that Peter sounded ok and to give him a lift. The bike just fitted in her car boot. In the evening we relaxed away the aches of the day at the hotels geothermal hot pools. The days ride was 60 miles with 2624ft of climb.Average speed was10.9 with 5hrs 24mins riding time. Nelson to Murchison,Thursday 27 January. For the Cycletourist needing an early start many New Zealand motels have the very useful facility that you can order a cooked or continental breakfast delivered to your room often as early as 7.15. We made use of this in Nelson. 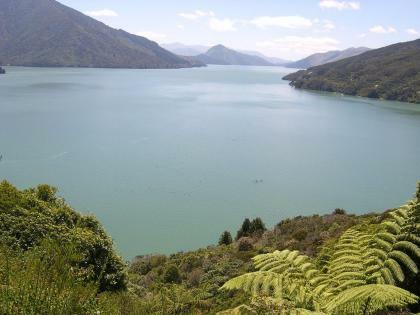 Another useful facility is the guidebook Pedallers Paradise in 2 parts for North and South Island. This gives guides to routes including graphs of the climbs involved which Peter found useful to know and details of facilities on the route including shops and cafes. The guide for todays route told us that after an elevenses break we were unlikley to find any food or water before our destination. We stocked up at a nearby Supermarket which was a Woolworths food store. bounded by mountains to Nelson. Temperatures were warming up by now. We were later to learn that in the inland area we were headed temperature during the day reached 34C. After a short descent from Spooners Saddle we started a long gradual climb with a steep section over the last mile to the 635 metres Hope Saddle. The last 20 miles seemed to drag. Eventually we got to our motel at about 8.30 pm. Ride distance was 79 miles with 3464ft of climb. Our average speed was 9.8 and riding time was 7 hrs 52 mins. 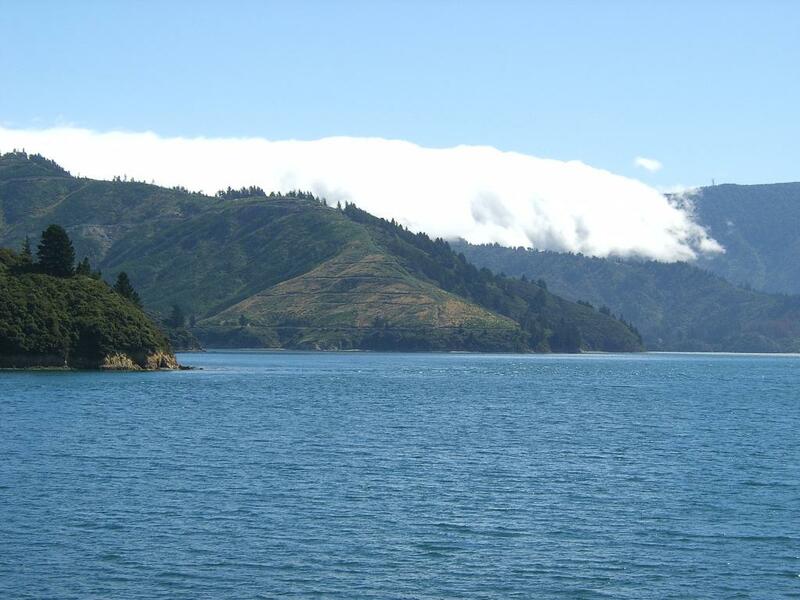 Today's ride was very scenic riding on Queen Charlotte Drive alongside Queen Charlotte Sound with views like that of a Norwegian Fjord. We stopped for elevenses at a cafe at Ngakuta Bay and then lunch at a Marina Cafe in the small town of Havelock. We stopped for a tea break at a cafe in the small town of Rai Valley before tackling the climb to 247 metres Rai Saddle. 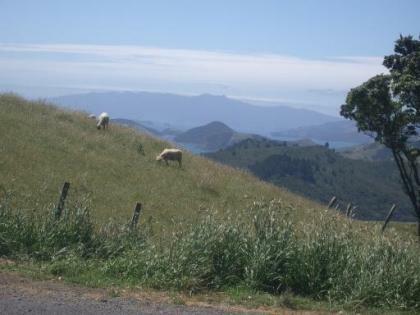 This was followed by a short descent and then the climb to the 357 metres Whangamoa saddle. By the time we rolled down to the coast of the Tasman Bay we were running quite late and arrived at our motel in Nelson at 8.30pm. During the day we completed 69 miles with 3421ft of climb at an average speed of 10.6 and time riding of 6hrs 22mins. Today we were due to catch the Interislandline ferry from Wellington to Picton on the north coast of South Island at 3.30 so we had some time to spend looking round Wellington. A little crisis developed first thing as I realised I had left my small Pentax Digital Camera on the train possibly in the seat pocket. 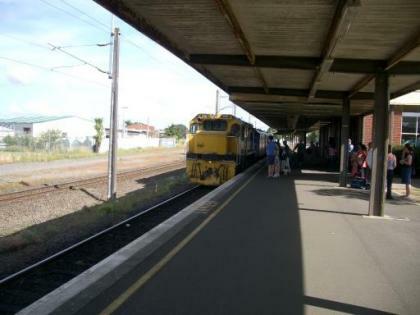 After a few phone calls to the lost property department and some checks were made it was established that the Camera had not been found during cleaning and the train had left a few hours before as the morning train to Auckland. The guard checked the train but there was no trace of the camera. We went to the Station and picked up confirmation that the loss had been reported for Insurance purposes. Some retail therapy followed to find me a new camera and Martin some new cycling sunglasses from a bike shop as he had left his old ones in a taxi back in Hamilton. The bike shop recommended a good local camera shop and I picked up a 5 megapixel Samsung Digimax V50 for 700 nz$ or 280 pounds. In the evening Martin asked me to help him organise the booking over the Internet of a bungi jump in Queenstown. This is the first time a Tour member has asked me to organise his suicide. The fateful day is fixed for the 5 February from the original Bungi Jump bridge at Queenstown. Watch this space!! For today we were taking our bikes by train from Hamilton in the north of North Island to Wellington in the south ready to start our exploration of South Island. We took the Tranz Scenic Overlander train which is one of only 2 a day. The object of these trains is to view the scenery as much as transport with frequent stops and long hauls up the many hills with scenic commentary. The 400 mile trip took 10 hours. Bike arrangements were quite good with the bikes pre-booked and we put them in the luggage van. The train journey included a famous spiral where the line curves round on itself to gain altitude. Today we were due to get the bus back to Hamilton at 5.15 p.m. so we had the day to explore the thermal sights of the Rotorua area. Many of the best sites are some distance out so we took a prebooked half day minibus trip with Elite Adventures. This was very good with Ben our Mauri driver and guide giving us all the local information and only us and an American couple in the group. 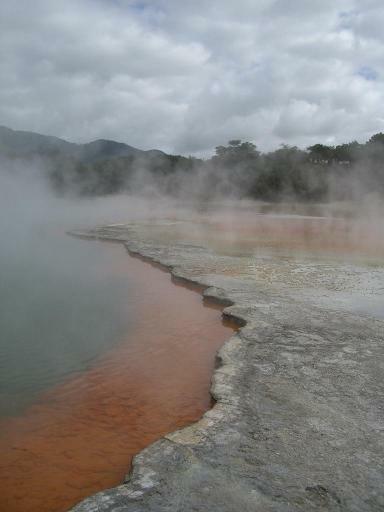 We started with the Wai-o- Tapu Thermal reserve with bubbling hot mud pools and multicoloured thermal pools. 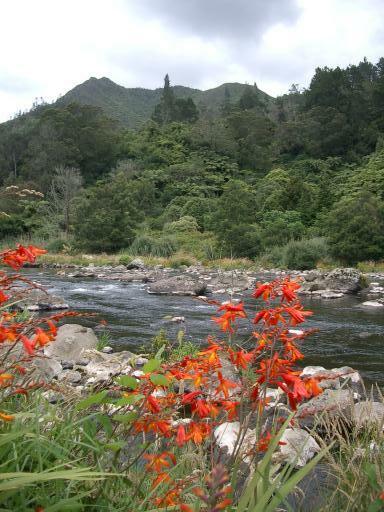 We then headed on to the Waimangu Vocanic valley to view more multi coloured hot pools among lush tropical vegetation. 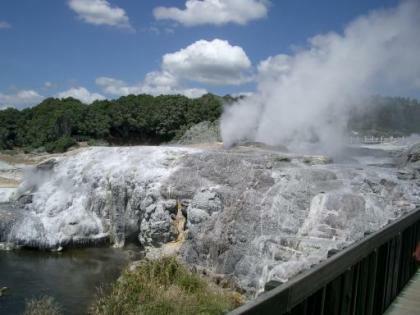 After some hard days of riding we now had some days off the bike to recuperate and get a trip to the thermal area of Rotorua into the itinerary. We left the bikes and half the luggage at the hotel in Hamilton. They had agreed to keep them until our return to them on Sunday. We caught an intercity bus to Rotorua arriving at 12.00. In the afternoon we took a taxi to the outskirts of town and explored the Mauri Arts and crafts centre and Whangamata thermal area. The day was rounded off by a soak in the motels swimming pool heated to 32C by thermal water. This was again a long days ride so we started early at 8.00. 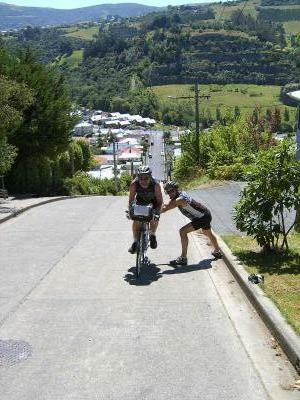 The main climb of the day was to 774 ft and then down to the town of Waihi for elevenses. We continued down the scenic Karangahake George to stop for lunch at the town of Paeroa. The afternoon was notable for some pan flat dead straight roads which I personally found more tiring than the hills. One road left Peroa and continued flat and without a bend for about 7 miles. Today was to be our hardest of the trip to date save for the ride into the high Andes. The days route was 79 miles with numerous climbs. We started early leaving the Motel at 8.00am. 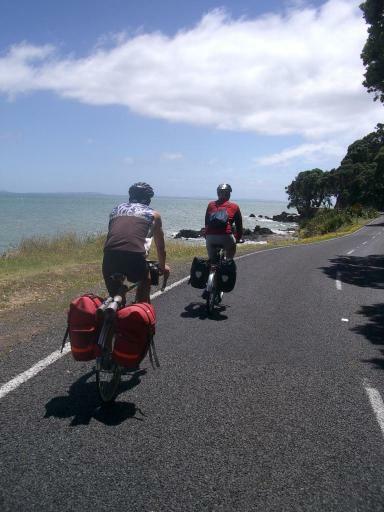 As we left Coromandel we started straight up the highest and steepest climb on the Peninsula up Wangapoura Hill. As we climbed the hill my Cyclo Bike computer with altitude and gradient functions showed gradients of between 10 and 12% for the 2 mile climb. For those living in West Sussex this was like climbing about 6 Duncton hills in succession. At the top of the climb at 1200ft we met 2 local cyclists on superlight bikes who were amazed at the weight carried on our bikes. They gave us the encouraging news that the route we planned was "a pig of a ride" and one of the toughest in New Zealand. After many small ups and downs and a big one to 700ft we stopped for lunch at a cafe in Whitianga. After lunch we rode alongside Mercury Bay Harbour and then many more small ups and downs and a big climb before stopping for a break at Tairua. One last big climb followed to get us to our Motel at 8.30pm over 12 hours after departing. When we got to the Motel room Peter fell onto a bed and went immediately to sleep. The Motel owner was very helpful and offered to pick up Pizzas for us. 79 miles for the day with 4700ft of climbing and an average speed of 9.1mph and riding time of 8 hours 20 minutes. 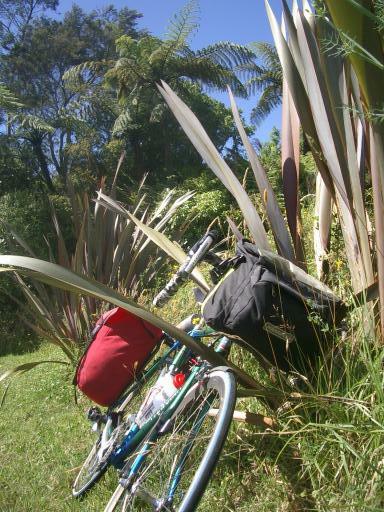 We were staying 2 nights in Coromandel so today was an out and back ride without panniers north up the peninsula to Colville. 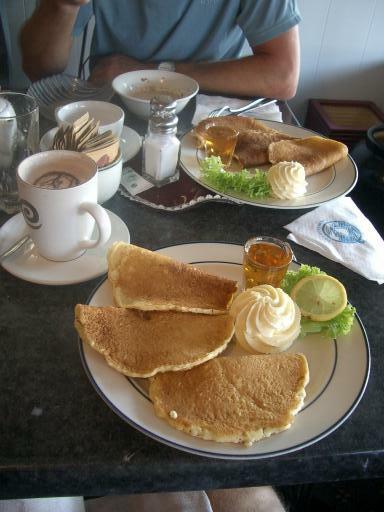 We stocked up with a Cafe breakfast of pancakes with maple syrup and cream. The ride was only 30 miles total but involved 3 climbs each way of between 4 and 600ft. 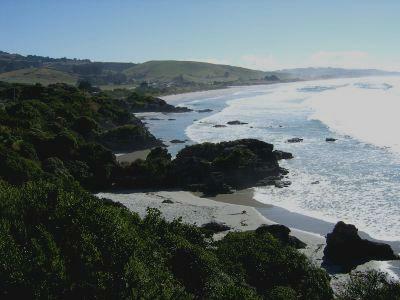 We headed north along the coast with more great scenic coast views. The tarmac dead-ends at Colville so the landscape became more remote as we went further north. The last of the climbs was the best with views from the top looking like the lost world of Jurassic Park. 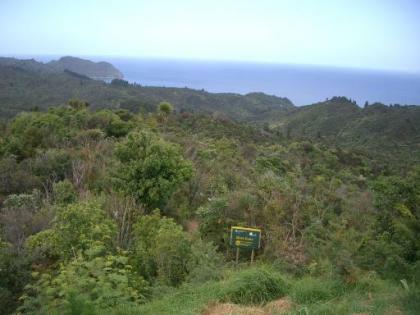 One notable thing about the landscape of the northern part of North Island is the mixture of temperate and tropical vegetation and this was very notable in the remote parts of the Coromandel with many types of fern growing. The first few hours of Tuesday there was drizzle and showery rain and as we had a very short mileage day we repaired to an internet cafe for some surfing followed by a short walk to a cafe for elevenses. green hills of the Coromandel range to our right. 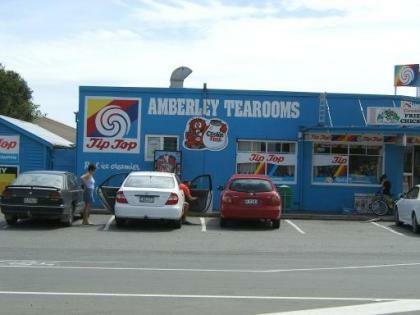 We stopped for lunch at some tea rooms in Tapu on the coast. In the afternoon there were two moderate climbs, one to 741ft and the other up to 550ft. Although Peter walked up these hills Martin and I didn't find it a problem only having to wait 15 to 20 minutes and with more time to admire the views. On arrival at the motel in Coromandel we made use of the Spa Bath to relax. 33.5 miles for the day and 1538 feet of climbing. Average speed 10.5. 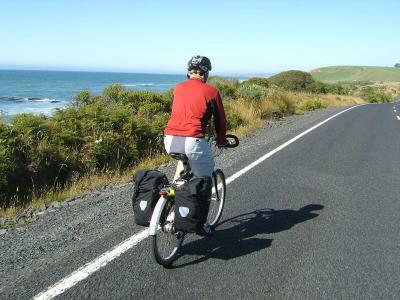 We looked forward to today with a little trepidation as our first day riding with loaded panniers. I had heard that we could get out of the urban area by using the Auckland suburban rail network. We headed to the Britomart Transport Centre near the ferries and took a lift with the bikes underground to a gleaming trains terminal. There were a few last minute platform changes but we did notice that the the train operator had just changed to Internationally renowned company Connex!! then joined a quiet minor road towards Miranda on the coast. Martin and I stopped at the top to take pictures of the view down to the coast while Peter continued on down. A local pulled up in a pickup and we got into conversation about our trip. 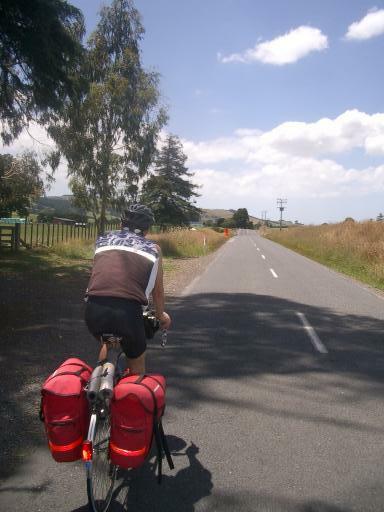 We told him we would be cycling up the Coromandel Peninsula. He asked if we had anything between our ears and Martin answered no. We debated whether to tell Peter that the next few days might be hard but in the end did so. Today we took our bikes by fast Catamaran ferry to the scenic Island of Waiheke about 20 miles off the eastern side of Auckland bay. We had arrived in New Zealand just after the end of a long wet spell and the day again dawned bright and sunny with temperatures up to 23C. The ferry ride was very similar to the ride to the Isle of Wight with the harbour full of boats and yachts. 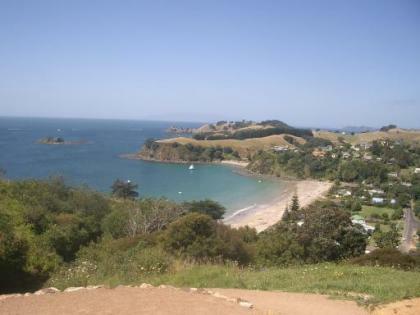 Waiheke island is a similar size to the Isle of Wight with many hills and scenic coves and beaches. We rode just 8 miles via Blackpool and Ostend to stop for a few hours sunbathing on Onetangi beach and lunch at a cafe. We returned on a scenic hilly route via Palm Beach. 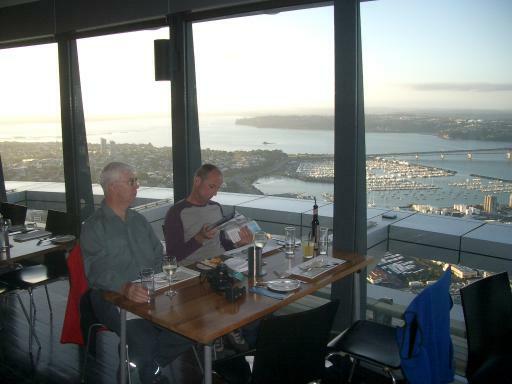 In the evening we headed to the Skytower for our prebooked evening meal at 196 meters. Considering the location the cost of this was very reasonable working out at about 20 pounds for an all you can eat buffet of which we took full advantage. 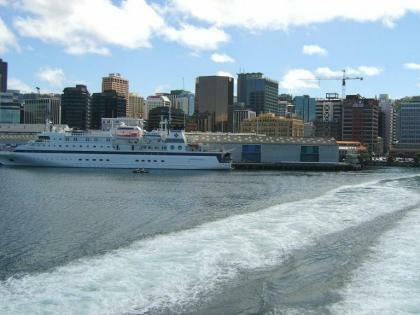 Although we only spent a few days in Auckland we were all very impressed by how clean and pleasant the City Centre is.